Ok. Today was capitulation day. Great! Sigh of relief and a sigh of disappointment. It’s a mixed bag. Is this a start of a greater pull back? I don’t know. Let’s just play within the rules: Define your risk or stop, enter a position, and respect the stop if the price reaches the stop. Everything stems from the concern in the middle east. Currently, the protests are happening in Libya, Morocco, Bahrain, Tunisia, and Yeman for different reasons. Just search for them on Google; there are myriads of information on what’s going on. The progressing political instability in the Middle East is affecting the commodities market. In fear of possible cut of oil supply, we’re seeing oil prices rise. I’m reading a lot of articles from some prominent economists that when the WTI Crude Oil Futures reach $100, we’re going to see consumer demand go down due to the cost push initiated with high oil prices. It makes sense but I’m not sure whether $100 is the tipping point. To me, $100 seems like a psychological value. But if the market *believes* so, then I must do the same. I’m just a single player after all. 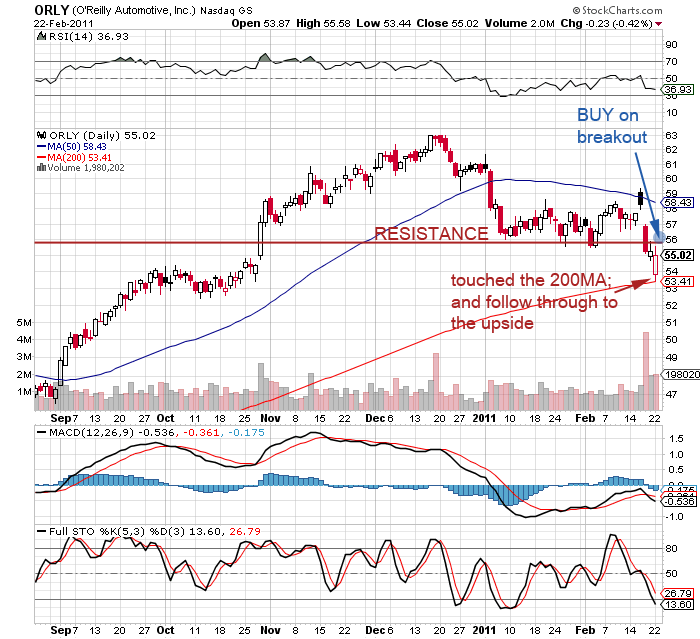 While going through some charts, I’ve found some nice setups in SPLS and ORLY. The setup I’m talking about today has two basic criteria: One is the price being near a major average, and the other is the oversold signal. I would monitor the two for now. I would only try when I see some buyers coming in and buying at higher bids. The stochastic K(12,3) has consistently signaled good buying points; we have a high probability trade with a 75% chance. Also, the price is nearing the 200 SMA of the high 20 level. Today’s price movement is a concern because the push for higher prices were not sustained; however, the strong upward price movement may sustain itself near the 200SMA. If I see buyers at that level, I’m going to give it a shot. 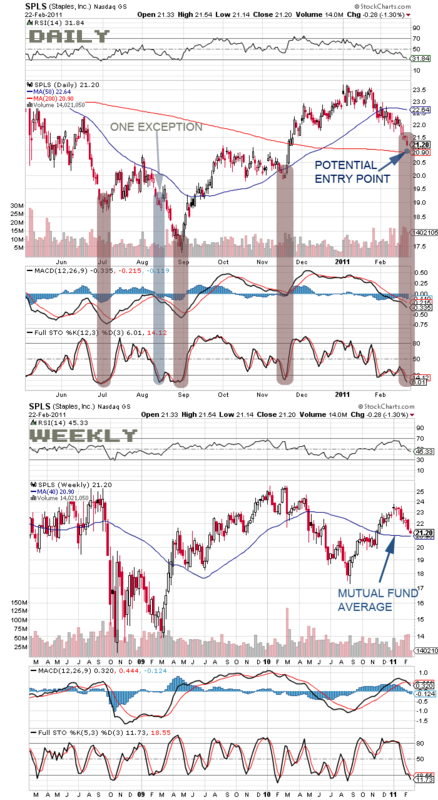 In addition to the daily chart, the price is still above the 40 SMA which is the so-called mutual fund average in the weekly chart. ORLY showed great price movement today. It touched the 200SMA and the price remained elevated although it bounced back after touching the recent resistance of higher 55 level. If the price can move above 56, I would be a buyer with a close stop near the high 55 level.